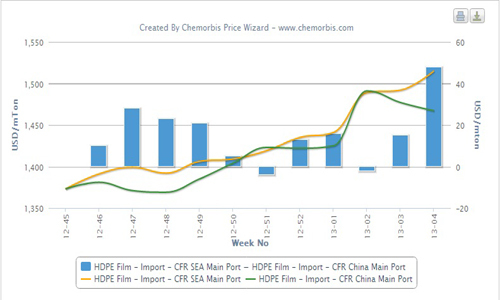 According to ChemOrbis, the sentiment has firmed up across the European PE markets as of last week after producers pioneered price hike attempts and pushed their prices back to January levels citing reduced availability and firmer expectations for the upcoming month. Ethylene contracts are anticipated to settle higher for March, with initial expectations calling for increases of €30-50/ton while a few players projected even larger gains this week. Looking at the spot market, ethylene prices climbed €50/ton on the week on the back of higher naphtha prices as well as bullish expectations for the March contracts. A South European producer settled their February PE contracts with decreases of €50/ton earlier in the month. As of last week, the producer raised their new February offers by €50/ton from their initial levels, rolling over their prices from January. A producer source cited tight supply and increasing energy costs as the main reasons behind their new pricing strategy. A West European producer also issued increases of €40/ton compared to the beginning of the month when they concluded some PE deals with decreases of €40/ton from January. A distributor in Italy reported raising his West and South European PE prices by €20/ton compared to the beginning of the month and added that he has almost sold out his February allocation. Converters confirm receiving higher PE offers over the past week while some of them regarded sellers’ recent hike requests as an attempt to stop the decreasing trend ahead of the awaited increases for March. 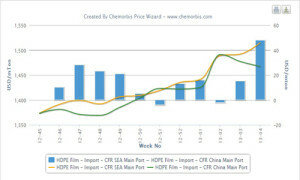 A buyer reported hearing talks of €70/ton increases for the upcoming ethylene contracts. A distributor in Belgium raised his PE prices by €30-40/ton compared to the beginning of the month when he conceded to discounts of €30/ton on his initial February deals as per ChemOrbis pricing service. A French distributor also lifted his PE prices by €50/ton from early February levels and added that he has limited volumes left for this month. A converter in Germany, who settled his February PE contracts with decreases of €40-70/ton, reported that he expects to see increases of up to €40/ton on the March ethylene contracts.